via GOP Freshman Comes Full Circle On Whether Social Security Is A Pyramid Scheme | TPMDC. So, here’s how it works: every pay period, my wife and I put a set amount of money into our joint bank account. At the same time, we’re writing checks against that joint bank account for things like our mortgage, phones, internet and the like. Provided that the amount of money we’re putting into the bank is the equal to or greater than the amount of money we’re paying out, there’s no problem. In fact, if the amount we contribute every month is greater than our monthly bills, we actually build up a surplus of extra money. Score! If on the other hand our bills start climbing (which of course they are) and they climb to a point greater than the amount we’re paying in, then we will start to eat away at that surplus until we eventually run into the negative. At that point, our joint bank account is “insolvent,” as they like to say. This is what the Congressman says is a “Pyramid scheme,” though I suspect most people would call it a fairly simple system of paying our shared bills. Social Security works in precisely the same fashion, with all of us contributing to a collective “joint bank account,” in this case a trust fund. Meanwhile, our seniors collect at a monthly rate on the other side (this would be us as a society paying our debt to the ones who raised us and did their best not to leave the country worse-off than they found it). The Congressman is correct in stating that the amount going in needs to be the same or greater than what’s going out, but that’s about as correct as he gets on the issue. He is quite wrong, for example, in stating that Social Security will be insolvent in twenty years. Social Security will be paying out more than it takes in – if we do nothing to correct the issue – some time in the next twenty years. But we still have that surplus thing, don’t we? Yes, we do. And our bank account will be quite solvent for the next seventy years – again, presuming that we do nothing about it at all. If the joint bank account shared between my wife and I ran into insolvency, we may presume that the Republican answer would be to scrap the whole affair and default on our debts. They seem to like the word “default” a lot more, these days, than I might have expected. Or, maybe the solution is to tell our debtors to take half the money and try playing the Stock Market for the rest. An easier solution would be to increase the amount of money we’re putting into the system. If we’re short twenty bucks, a hundred bucks, whatever amount for the month, we just chip in a little more – maybe plus a bit to start building up our surplus again. In the case of Social Security, one answer would be to raise the cap on SS payments: above $106,000 a year, any additional money you earn does not get calculated to figure your Social Security tax. You don’t pay on that extra cash now, but we could eliminate or significantly raise that cap and have a whole lot more money going toward paying for our senior’s continued existence. Or we could raise everybody’s Social Security (FICA) tax rate. Gasp! That great bugaboo of American politics: raising taxes. The current rate is around 6.2% and its gotten us by for eighty years. We raise that rate to 7 and we can probably go another eighty. Or we could raise the retirement age. This would probably give us the biggest bang for the buck, but would also be the least-responsible choice. As often as we hear about the life expectancy going up in this country, the truth is that infant mortality rates are a greater contributor to that fact than elder care: the life expectancy for retirees has not changed much at all. So, raising the retirement age is just a Promethian yanking of the chain on people who don’t deserve it. But its an option, isn’t it? There are lots of options. But junking the system or taking the billions of contributed dollars in FICA taxes and handing it over to Wall Street, that paragon of fiduciary responsibility? Well, that really is calling for radical change, isn’t it? Republicans have been getting a lot of flack for not bringing ideas to the table at a time when our nation desperately needs them. But the recent budget proposal by Republican House Budget maven Paul Ryan is a sharp rebuke to the notion that Republicans bring nothing to the table and an outright rejection of the notion that Republicans are so ruled by ideology that they cannot propose ideas outside their narrow scope. 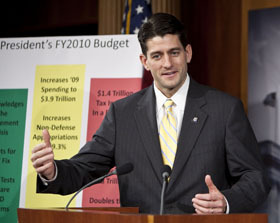 Among its many plans, the Ryan budget proposal calls for nationalizing the Stock Market. It is true that, in discussing the topic of the Republican plan for Social Security, the phrase generally used is “privatizing Social Security.” But consider what the plan actually proposes. Just as the last proposal under George W. Bush did, the plan allows taxpayers to reroute a portion of their FICA taxes to “personal savings accounts.” So far, it almost seems private, except for the fact that the government isn’t giving your money back to you and they’re not ceasing to remove FICA taxes from your paycheck: you’re still paying taxes. It is a “personal savings account,” which means according to the plan that it will allow you to pass on your balance to your children. But what do you invest in? Well, according to the plan, you invest in “a series of funds managed by the U.S. government.” Ok, got that? You don’t invest the money yourself, it gets taken out of your paycheck. And you don’t get to pick the funds, the government does. It’s private. Remember that. The modernization of the retirement age will not affect the ability of an individual who chooses the personal account system to retire early, as long as his or her account has accumulated enough funds to provide an annuity equivalent to 150 percent of poverty. For those of you whom, like me, are less familiar with such financial jargon, that would be defined as, “income from capital investment paid in a series of regular payments.” That means that the government isn’t giving you your money back or ceasing FICA payments; it’s only allowing you to invest in the funds that they’ve setup; and apparently, they decide when and how much of “your” money you get back. Sounds pretty private, huh? So far, this doesn’t seem very private at all. It sounds like the federal government doing with your FICA money something not unlike what the states do with your money by investing it in funds. Except, of course, with the veneer of privacy. But here’s a question: how much money do you think gets invested into the Social Security trust fund every year? How much of the taxes that we pay goes directly into the trust fund – and how much would therefore be invested into the stock market under the Republican plan? Would you believe $700 billion annually? It is difficult to find the answer to the question “how much new capital is invested in the stock market every year.” After all, which market? The Dow? The NASDAQ? And what constitutes “new” money? But consider this: if one entity comes into the game with three quarters of a trillion dollars to spend every single year – not a fluctuating number like private investment, a stable number from taxation – whom do you think calls the shots in that marketplace? How long before the U.S. government owns a controlling interest in the entire market? Guarantee of Contributions. Individuals who choose to invest in personal accounts will be ensured every dollar they place into an account will be guaranteed, even after inflation. With the recent market downturn, individuals must be assured their retirement is secure. By guaranteeing the dollars put into an account, individuals can be assured that a large-scale market downturn will not cost them their Social Security personal accounts. Pray tell, who is paying for that? Well, clearly if the government is required to insure every dollar you’ve invested into the stock market, they’re going to need to do everything in their considerable power to prevent that market downturn from ever happening. I think that it’s interesting in the current debate over health care that Republicans keep insisting that a government-run health care system would force private insurers out of business. Jon Greenbaum chimes in with a hugely salient point which is being lost in this whole conversation: if a government-run health insurance program would force private insurers out of business, what is different about the government-run pension system known as Social Security which makes it unable to force out it’s own private competition? The difference, I might suggest, is none. And a public option for health insurance would likely have the same effect on that marketplace as Social Security has had on pensions: covering the uncovered, driving down costs and improving the quality of life for Americans across the board. After all, imagine how much more expensive life would be if your retired parents were dirt-poor with no means of income like 80% of pre-SS seniors. The fact is, wherever there is a service provide, there is a Cadillac version rich people pay for. The same will be true of health insurance in a public option world. What will be different then and now is that insurers will need to provide services at prices which are reasonable, unless they want to confine themselves to being the over-priced, exclusive and much smaller solution to the very rich.